In our increasingly connected and online world, navigating spam, identity theft, frauds and other cybersecurity issues has become more and more important, especially for children. Luckily, researchers like Sana Maqsood are developing methods to educate children about cyber security topics. Maqsood is a PhD student in Computer Science here at Carleton University and is working in collaboration with MediaSmarts on upgrading a popular educational video game called A Day in the Life of the Jo’s. MediaSmarts is a Canadian not-for-profit charitable organization that has been developing digital and media literacy programs and resources for Canadian homes, schools and communities since 1996. The original version of the game was created over 10 years ago and continues to be one of the most popular resources on the MediaSmarts website. “The game itself is pretty basic and needed updating, so we were delighted at the opportunity to work with someone as skilled as Sana through a MITACS grant to help us re-envision it in a more sophisticated way for today’s students,” said Co-Executive Director of MediaSmarts Jane Tallim. “There is a tremendous need for educational resources that reflect the networked lives of Canadian youth,” said Tallim. In the game, players follow the brother sister duo of Jo and Josie in their daily lives and help them make smart choices online. Players are presented with a scenario (for example, Josie getting bullied in an online game) and are asked to help Jo or Josie decide what to do in that situation. “From interviews with 11-13 year old children, we found that they’re aware of cybersecurity but do not have a deep understanding of the topics or how to deal with these situations in real life,” said Maqsood. Maqsood’s research was funded by the Mitacs-Accelerate PhD fellowship and was supervised by Sonia Chiasson, Associate Professor in the School of Computer Science. “Sonia and I brainstormed ideas for the game together, and she was also instrumental in helping me balance our commitments to MediaSmarts and my PhD workload,” said Maqsood. 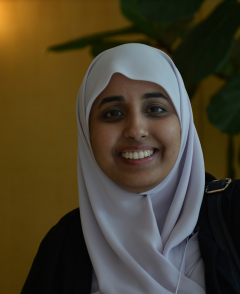 Maqsood completed her Masters in Human Computer Interaction from Carleton in 2014, and then worked as a User Experience designer for the Government of Canada before returning to complete her PhD in 2015. “I decided to pursue my PhD at Carleton because of my supervisor. I did my Masters with Sonia and really liked working with her,” said Maqsood. A Day in the Life of the Jo’s will be available in the near future through licensing arrangements to provincial and territorial departments of education, library systems, school districts and boards, post-secondary institutions, as well as individual schools. To view a segment of A Day in the Life of the Jo’s, click here.